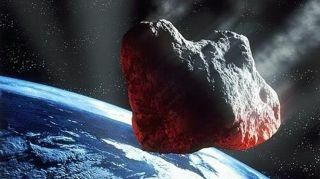 NEW YORK - A distinguished panel of astronauts will meet here Friday (Oct. 25) to discuss the threat asteroid strikes pose to Earth, and you can watch the conversation live online. Five spaceflyers representing three different space agencies will talk about how humanity can best detect and deflect potentially dangerous asteroids. You watch the event, which will be hosted by astrophysicist Neil deGrasse Tyson at the American Museum of Natural History in New York City, live here at SPACE.com beginning at 11 a.m. EDT (1500 GMT) on Friday. Thomas Jones, former NASA astronaut, senior research scientist at the Florida Institute for Human and Machine Cognition. Russell Schweickart, former NASA astronaut, Association of Space Explorers founder, and chairman of the board of the B612 Foundation. Dumitru-Dorin Prunariu, former Romanian astronaut and vice president of the European International Institute for Risk, Security, and Communication Management. Soichi Noguchi, engineer and JAXA astronaut. Edward Lu, former NASA astronaut and chairman and CEO of the B612 Foundation. The group will likely devote a portion of their discussion to the Sentinel Space Telescope, which the B612 Foundation — a nonprofit organization focused on protecting humanity from asteroid impacts — is currently building specifically to detect hazardous space rocks before they hit Earth.